NEW ORLEANS – With the NAIA’s regular season now in the books, the Indiana Tech men and women remained atop the U.S. Track & Field and Cross Country Coaches Association (USTFCCCA) National Team Computer Rankings released Wednesday as they have for the duration of 2014. 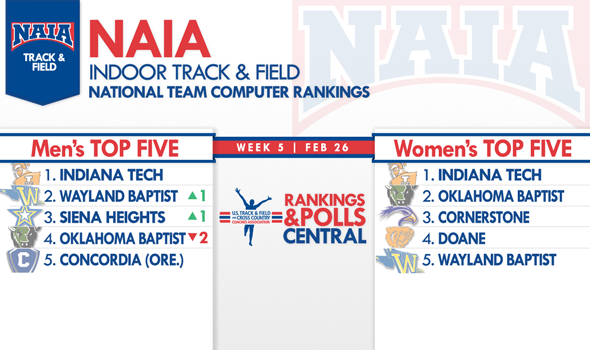 The defending outdoor champions for both men and women, Indiana Tech topped both genders’ rankings in the penultimate edition of the indoor track & field rankings for 2014. Next week’s pre-championships rankings on Monday will be calculated using only student-athletes who appear among the official fields that will be announced Friday morning. Using the final descending order lists as the basis this week, the WHAC champion Indiana Tech men (435.81) remained heavy favorites over a trio of teams locked in a battle for the No. 2 spot. That spot ultimately went to Wayland Baptist (Texas) (275.77), which moved up a spot from last week and narrowly beat out another team that stepped up one position in No. 3 Siena Heights (Mich.) (273.41). Defending indoor champion Oklahoma Baptist (271.41) dropped two spots from last week, while Concordia (Ore.) (245.84) made up some ground at No. 5. Much of the top 10 stood pat from last week, including stationary No. 6 Oklahoma City (197.13), GPAC champion No. 7 Concordia (Neb.) (167.40) and No. 10 Olivet Nazarene (Ill.) (142.79). Up one spot from a week ago was No. 8 Carroll (Mont.) (154.60) and up two was No. 9 Doane (Neb.) (143.17). The biggest gainer in the final weekend of NAIA competition was No. 21 Westmont (Calif.), which improved 12 spots from a week ago. In fact, the No. 9 Westmont women were also the team to best take advantage of this past weekend as the most improved team with a four-spot jump from last week. But, once again, it was WHAC champion Indiana Tech (519.76) that owned the rankings as it has all season long, though defending indoor champion No. 2 Oklahoma Baptist (392.81) was able to slightly bridge the gap. The entirety of the top five, including those two teams, held firm in their positions from last week. No. 3 Cornerstone (Mich.) (229.75), No. 4 Doane (Neb.) (222.42) and No. 5 Wayland Baptist (Texas) (216.63) all remained exceptionally close in the computer’s projection. No. 6 Concordia (Neb.) (175.51) and No. 7 College of Idaho (167.45) swapped spots, No. 8 Hastings (Neb.) (147.70) stayed steady, the aforementioned No. 9 Westmont women (111.18) improved four and No. 10 Siena Heights (Mich.) (109.05) remained in place to complete the top 10. The purpose and methodology of the rankings is to create an index that showcases the teams that have the best potential of achieving the top spots in the national team race. A full description of the rankings can be found here. Qualification for the NAIA Championships will not be determined in any way by these rankings, which are not officially sanctioned or endorsed by the NAIA for the 2014 season. These rankings are supported by the NAIA from the standpoint of media and entertainment purposes only. The USTFCCCA National Team Computer Rankings should not be referred to as a “poll” as no voting occurs during the process.